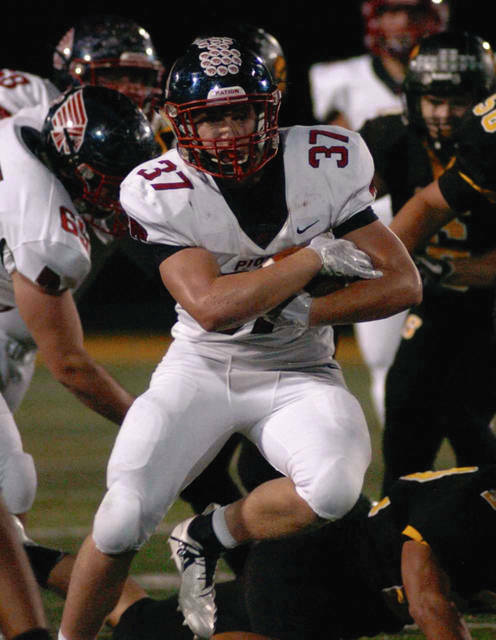 Amanda Ullery|Call Photo Piqua’s Trenton Foster turns upfield Friday night. Amanda Ullery|Call Photo Piqua quarterback Mick Karn finds running room Friday night. Amanda Ullery|Call Photo Piqua’s Makeegen Kuhn fights for yardage Friday night. SIDNEY — For much of the night, Piqua was its own worst enemy against Sidney at Sidney Memorial Stadium/30&0 Field. But, in the end, the Indians made enough big plays to improve to 4-2 overall and win the GWOC North opener with a 14-12 victory, while Sidney dropped to 3-3. And most importantly, the Indians brought the “Battered Helmet” home. But, even at the end, there were some anxious moments. Piqua got the ball back with 5:07 remaining and trying to run the clock out. But, after two first downs and Sidney without timeouts, running out of bounds and an incomplete pass gave Sidney an opportunity with more than a minute to go. “We obviously need to do a better job of clock management there at the end,” Nees said. But, a 43-yard punt was downed by Piqua’s Makeegen Kuhn at the one-yard line with a little over a minute remaining. Sidney quarterback Ryan Dunham completed a pass on an attempted hook-and-lateral play to Lathan Jones. But, the lateral ended up on the ground. While, Sidney recovered the fumble, almost 30 seconds ran off the clock and Sidney would turn the ball over on downs and Piqua had to kneel down once and the “Battered Helmet” was on its way back to Piqua. “Overall, I thought our defense did a pretty good job tonight,” Nees said. Sidney being without Hallie Truesdale ended up being a big factor in the game as well. Sidney drove down inside Piqua’s 10 on its opening drive, but was unable to get points, missing a 26-yard field goal wide. Then, both teams made big plays. First, facing a fourth-and-three midway through the second quarter, Sidney tried a quick kick from its own 40. But, Piqua’s Brennan Toopes blocked Dunham’s attempt. The ball bounced up to him at the 36-yard line and he raced all the way to the Sidney 3-yard line. Three plays later, Piqua quarterback Mick Karn found the end zone from four yards out and Karn’s kick made it 7-0 with 5:49 to go in the half. But, it didn’t take long for Sidney to answer. Two plays after the kickoff, Dunham threw a 53-yard strike to Darren Taborn for the score. But, the kick was wide and the teams went to the locker room with Piqua leading 7-6. “We made the big play, but then we gave up a big play,” Nees said. Piqua dominated the third quarter, but two fumbles — along with multiple costly penalties kept the Indians from adding any points to the scoreboard. The Indians got the ball back at midfield after a short punt with 1:17 remaining in the third quarter and put together what would be the game-winning drive. Karn had a 13-yard run on the drive and another 10-yard run to take the ball down to the Sidney one-yard line. After Kuhn was stopped on first down, Karn found the end zone on second down and his kick gave Piqua a 14-6 lead with 7:45 remaining in the game. Again, Sidney was able to answer with a 65-yard drive. 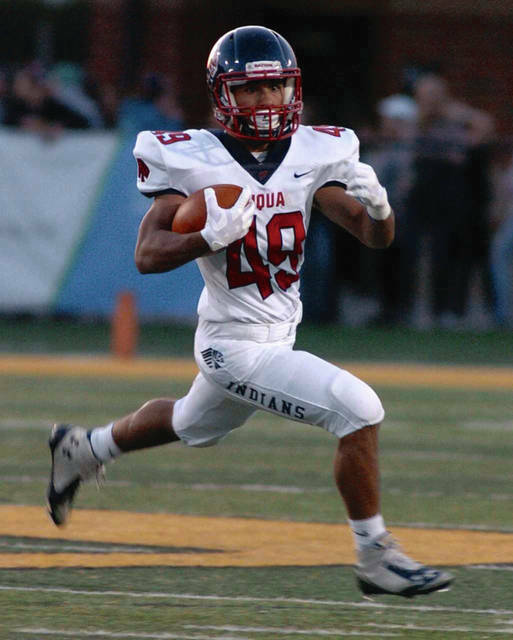 After an 18-yard pass from Dunham to Ratez Roberts, Caleb Harris broke loose on a 37-yard run to the Piqua eight. The Piqua defense stiffened, but on fourth-and-goal from the seven, Dunham found Taborn in the back right corner of the end zone to make it 14-12. But, the PAT to tie the game resulted in an incomplete pass and Piqua kept the lead with 5:07 remaining. “That was a big play by the defense,” Nees said. That set up the dramatic finish. Karn rushed for 131 yards on 21 carries and completed eight of 12 passes for 121 yards, with Owen Toopes catching six passes for 93 yards. Dunham completed 18 of 26 passes for 177 yards, with Taborn catching five passes for 94 yards. Harris had 16 carries for 82 yards. The Indians will be back in action Friday, hosting Greenville — with the “Battered Helmet” back in its rightful place at the Alexander Stadium/Purk Field facility. https://www.dailycall.com/wp-content/uploads/sites/30/2018/09/web1_index.jpgAmanda Ullery|Call Photo Piqua’s Trenton Foster turns upfield Friday night. 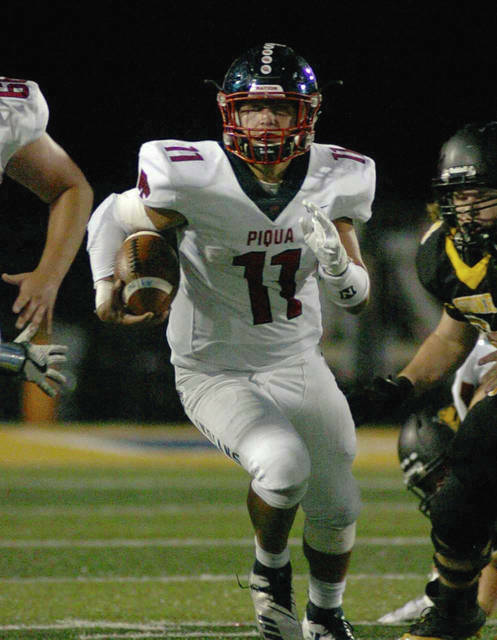 https://www.dailycall.com/wp-content/uploads/sites/30/2018/09/web1_karn.jpgAmanda Ullery|Call Photo Piqua quarterback Mick Karn finds running room Friday night. https://www.dailycall.com/wp-content/uploads/sites/30/2018/09/web1_kuhn.jpgAmanda Ullery|Call Photo Piqua’s Makeegen Kuhn fights for yardage Friday night.